For some people, staying in touch at all times is crucial. There have been some places in life where people have not been able to get a mobile signal or have been permitted to use their mobile but it looks as though the times are changing. There has already been debate and discussion over whether allowing passengers to use their mobile phones on airplanes is a good thing. There is no safety or security reason why people cannot use their mobile phones on planes, so any dissenters are just people that don’t like other people talking. Another area where mobile phones have been of no use, but could soon be, is the Channel Tunnel. This is down to the fact that passengers going from the UK to France will be able to use their mobile phones from March. This is down to the fact that the Eurotunnel company has signed a 10 year deal with EE and Vodafone. Users of these networks will be able to access 2G and 3G services in the North tunnel, which is the tunnel that is usually used by trains leaving the United Kingdom and heading towards France. Although no confirmed details about the availability of 4G availability has been announced, both companies are expected to be able to offer this service at some point in the near future. There are rumours that EE will have their 4G system up and running in the Channel Tunnel by the summer of this year but this is yet to be confirmed by the company. There are plans for the South Tunnel to be supported by UK providers, bringing passengers from France to the United Kingdom to be supported by UK companies, but there is no confirmation or acknowledgment of when this will occur. 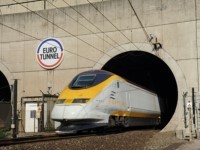 Passengers travelling from France to the United Kingdom have been able to access the internet and use their phones by connecting to one of the three French providers who have been connected since the summer of 2012. French telecom operators were keen to have a service up and running in the Channel Tunnel before the Olympic Games in London got underway and SFR, Bouygues Telecom and Orange have provided a service on the South Tunnel. One positive aspect of this arrangement is that there will be no disruption to the Channel Tunnel service to ensure that this connectivity is in place. This is due to the fact that the work required to provide this connectivity has already been carried out. In 2011, Alcatel Lucent were employed to install cables and mobile radios in both tunnels to enable drivers and technicians to be able to access a telecoms network. There are radios located every 740 metres in the tunnel and they have been set up with a “leak” signal capability, which means that the strength of connection does not leak when in the middle of two points. When you think that the Channel Tunnel drops down to a level of 100m beneath the sea, you realise that this quite a feat for the companies. Given that Vodafone and EE have a ten year agreement, they are certainly lining up for sticking with the plan for a lengthy period of time. There will be some people bemoaning the fact that people couldn’t live without their mobile phones for this part of a trip but in reality, why should people have to do without their phones? This new connectivity will provide people with coverage for about 35 minutes of journey where there was previously no connectivity at all. O2 and Three users will be able to utilise this connectivity in the Channel Tunnel but they will need to manually switch to the Vodafone or EE service. This will incur a higher level of cost, so it will be up to the individual user to determine if there is value in gaining connectivity for less than hour.